Placement: Mount your new coral using IC gel glue, putty, or a combinations of both. Place the coral on a rock or ledge in a location that receives direct lighting and ample flow. 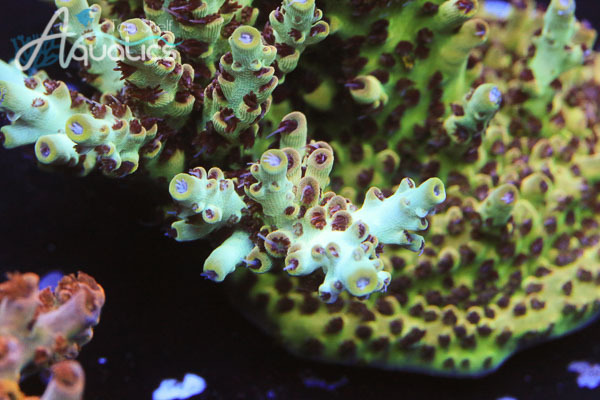 Feeding: Top Shelf Aquatics recommends feeding acropora corals with a combination of foods like Zooplanktons, Phytoplanktons, Amino Acids and other Organic Proteins . A daily broadcast feeding while return and circulations pumps are stopped will ensure the corals have the ability to consume the nutrients they require. Lighting & Flow: Acropora corals require moderate to high water flow and intense lighting to maintain proper color. T5’s, Metal Halides, or LED’s can all grow acropora when the proper PAR levels are provided. We recommend a 18-20K color spectrum for best coloration. Water Conditions: 75-80° F; sg 1.025-1.026; pH 8.1-8.4, Ca 420-440 ppm, Alk 8-9.5 dKH, Mg 1300-1450, Nitrates <10ppm, Phosphates < .10ppm.